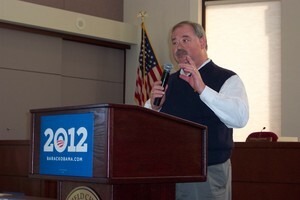 Posted on Sat, Jan 28, 2012 : 4:28 p.m.
John Cherry, a candidate for University of Michigan regent, speaks Saturday at the Washtenaw County Democratic Party's forum at the Pittsfield Township Administration Building. The theme of education set forth by President Barack Obama in his speech at the University of Michigan Friday was still resounding for many at the Washtenaw County Democratic Party's forum Saturday. "Today we're going to launch a Race to the Top for college affordability," Obama told some 4,000 attendees at U-M Friday. "We're telling the states if you can find new ways to bring down the cost of college and make it easier for more students to graduate, we'll help you do it." Three Democratic candidates for U-M Regent spoke at Saturday's Democratic forum at the Pittsfield Township Administration Building, all addressing the importance of education. "We have an obligation to provide every Michigan child free and public education in grades K-16," said candidate John Cherry, former lieutenant governor of Michigan. "That's how you build prosperity in Michigan." Mark Bernstein, another candidate for U-M regent, said, "Whatever the state cuts, it goes on the back of students and their families. It is an economic imperative to have accessible, exceptional public universities." U-M regent candidate Shauna Ryder Diggs agreed. "When someone has talent, intellect and desire, you should be able to complete your studies and not be burdened by student debt. We need to balance grants and loans to students and encourage them to remain in our state." More than 60 people attended Saturday forum, and candidates who spoke also included those for the Michigan Supreme Court, Circuit Court judge and state representative. The Michigan Democratic Party's Endorsement Convention is March 10 at Cobo Center in Detroit. Delegates will endorse three candidates for the Michigan Supreme Court and eight candidates for statewide education boards. For more information, go to www.michigandems.com. The link may not work, but the website does for those who spend thirty seconds trying it: <a href="http://www.michigandems.com" rel='nofollow'>www.michigandems.com</a> Sometimes it's just easier to complain. Sun, Jan 29, 2012 : 12:27 p.m.
My vote will go to anyone who promises not to be a rubber-stamp for the President and the administration, especially the Athletic Department. Most of the current and past Regents seem to view their position as not much more than a nice addition to their resume; how else to explain, for instance, the extraordinary leeway given the Athletic Department in hiring and ultimately firing Coach Rodriguez? The Administration and the Athletic Department spent @ $14,000,000 to hire, keep and later fire RR, and all with zero or at best minimal Regent oversight: Salary for 3 years @ $2,500,000 = $7,500,000 Payment to WVU to settle lawsuit against Rodriguez: $2,500,000 Taxes on the payment to WVU*: @ $1,600,000 Severance payment to Rodriguez: $2,500,000 Total = @$14,100,000 * payment of $2,500,000 to WVU was considered as additional compensation to Rodriguez, since the UM was NOT a party to the lawsuit; this made Rodriguez liable for federal and State taxes on that amount. The UM graciously paid those taxes on Rodriguez' behalf. Sun, Jan 29, 2012 : 4:56 a.m. I think Mark Bernstein lives in Ann Arbor. It sure would be nice to at least get a one sentence bio of each candidate in the story... And did they say anything else? Sun, Jan 29, 2012 : 12:28 a.m. The link you provide for Michigan Dems is dead. But their site doesn't contain the information you suggest. Perhaps you mean <a href="http://www.washtenawdems.com?" rel='nofollow'>www.washtenawdems.com?</a> Unfortunately, that site doesn't offer any more information about these candidates either. This is where the &quot;reporter&quot; comes in. Who are these people? What are their educational and professional backgrounds? What are their platforms? Why do they believe they are qualified to be trustees of one of the finest public research universities in the world? What connections do they have with other Michigan politicians? Have you learned anything about the candidates that suggest they might have specific agendas? What do they see as the primary concerns for UM in the coming decade? And has journalism finally given up the ghost in Ann Arbor? Anyone of them willing to boot the Dean's being paid exorbitant salaries on the backs of students and accessible education? Anyone? Do it, and you get my vote. Toss in no more sabbaticals and raises for teaching professors and I will even campaign for you. Visit <a href="http://www.professorkaffmanforregent.com" rel='nofollow'>www.professorkaffmanforregent.com</a> Professor Kaufman is an experienced professor at UM and is the true reform candidate in the race. Not a peep from all three candidates on judicious use of taxpayer dollars? Controlling tuition raises way over inflation? One candidate &quot;free&quot; in grades from K-16? Truly a special choir practice.